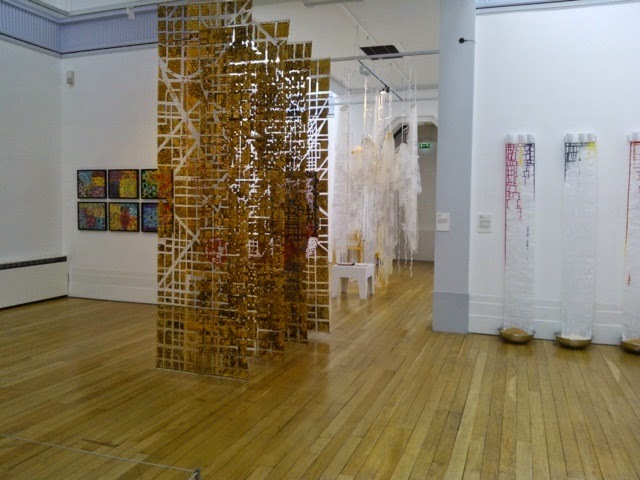 My textile installation 'Bitter Harvest' which is dyed on the wall ( I call it vertical performance dyeing), is part of a group show at Bilston Craft Gallery in the UK. The exhibitors are agroup of international quilt/textile artists exhibiting under the group name ' Throughourhands' and the show has been organised by Linda Kemshall and Annabel Rainbow. I would have loved to have been at the opening but it was not possible at this time. Although I might get to the UK and Europe in October this year, but that doesn't coincide with either of the shows I will be in this year! 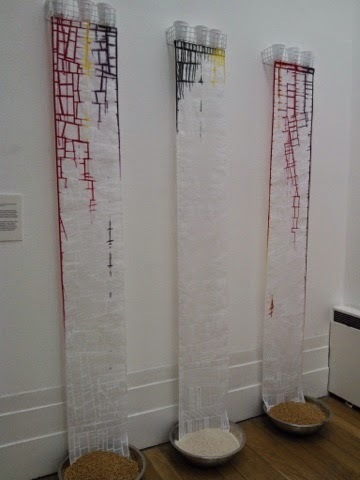 The vertical dyeing pieces plus a new and as yet unfinished piece will be shown at Festival of Quilts in August. I am grateful to ThroughOurHands for making it possible for me to show my performance dyeing pieces in the UK. In the meantime I should be making the piece for this show, the idea is in my head but house renovations ( kitchen, dining room, lounge) plus preparing my mother's house for sale keeps me out of the studio. Your work is just fabulous Clare, and we're so thrilled to be able to show it as part of The Liberated Quilt, and later on at Festival of Quilts. It was quite nerve wracking getting up on the ladder and trying not to spill dye everywhere but Laura and I enjoyed seeing the dyes run out and make beautiful patterns along the stitching lines. Well done you, a first I think for the UK!